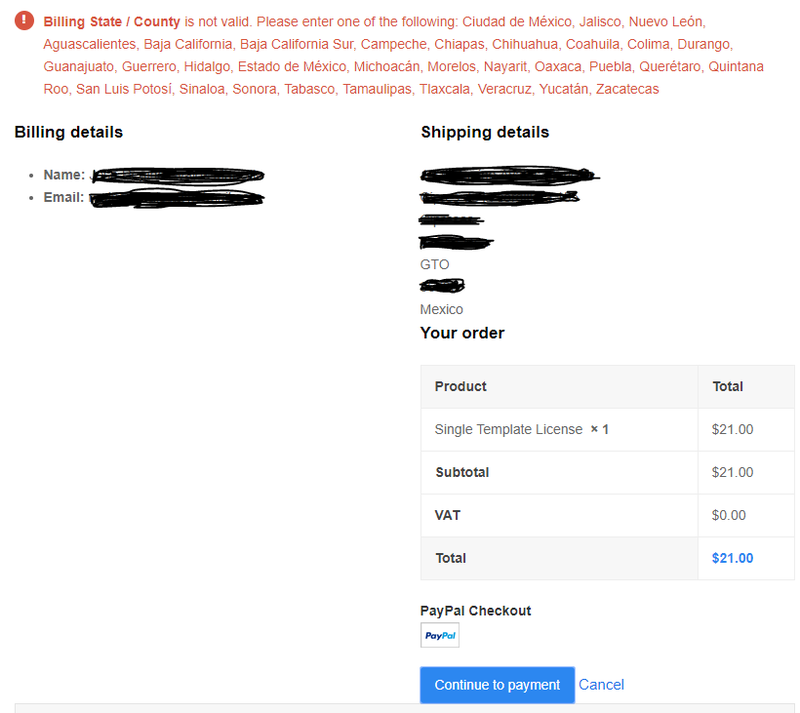 I’m trying to purchase a single template license in Mexico, but when I try to do the payment, the page throws me a billing information error, the problem is that since all of my Billing Information it’s been taken from my PayPal account, the page doesn’t allow me the possibility to modify the data. On my particular case, “GTO” is equal to “Guanajuato”, which is one of the “allowed” options displayed on the error message, but I think the page is taking the short name of the state where I belong, instead of the long name of that state and I’m guessing that could be the reason of why it’s throwing that error. What about to use Guanajuato and not GTO? can you do that? I did a second try on this, and I think there’s an issue when your page retrieves the data automatically from the PayPal account that you may consideer to adjust in the future, since the page takes and assigns that information automatically, it seems like it gets the “State” short name instead of the long name, maybe this issue just happens with orders from Mexico, idk. I were able to do the purchase cancelling my first order and proceeded to fullfill the checkout information manually, instead of selecting the PayPal option since the very begining, so I were able to input my billing information manually and then proceed to do the payment with my PayPal account. So if there’s anyone who could have the same issue as me, try to proceed with the checkout first and fill your billing information manually, and then you can select you PayPal account to continue with the payment. The topic ‘Trying to purchase Single Template License but page doesn't allow me’ is closed to new replies.